Physicists at the Technische Universitaet Muenchen (TUM) and the University of Michigan have constructed synthetic membrane channels using DNA molecules as programmable building materials for custom-designed, self-assembling, nanoscale structures. Synthetic membrane channels could be used as molecular sensors, antimicrobial agents, and drivers of novel nanodevices. To wall off the insides of cells from the outside world, organisms in all three domains of life use the same kind of barrier: an impermeable membrane made from two layers of lipid molecules. Such membranes can also be found within cells, for example encapsulating the nucleus, and even surrounding many kinds of viruses. And to mediate between the different environments on either side of this universal barrier, nature provides a common type of passageway. Membrane channels are tube-like structures made of proteins, which pierce the barriers and regulate the two-way exchange of material and information between the inside and outside. Now researchers have demonstrated the first artificial membrane channel made entirely of DNA. “If you want, for example, to inject something into a cell, you have to find a way to punch a hole into the cell membrane, and this device can do that, at least with model cell membranes,” says TUM Prof. Hendrik Dietz, a fellow of the TUM Institute for Advanced Study. In a shape inspired by a natural channel protein, the DNA-based membrane channel consists of a needle-like stem 42 nanometers long with an internal diameter of just two nanometers, partly sheathed by a barrel-shaped cap. 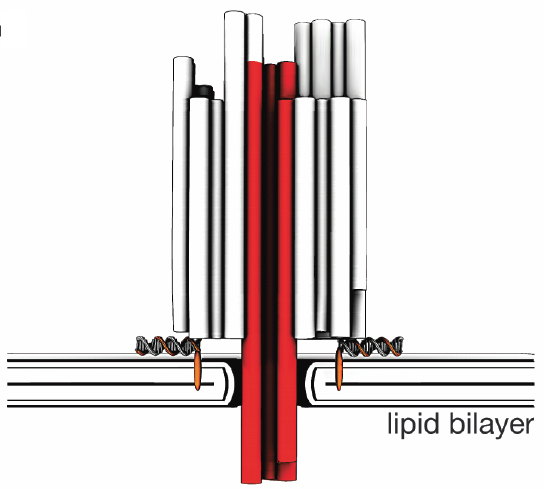 A ring of cholesterol units around the edge of the cap helps the device “dock” to a lipid membrane while the stem sticks through it, forming a channel that appears to function like the real thing. Further experiments demonstrated that the resulting pores have electrical conductivity comparable to that of a natural cell wall with ion channels, suggesting that they might be able to act like voltage-controlled gates. The results also suggest that transmembrane current could be tuned by adjusting fine structural details of the synthetic channels. To test one potential application of the DNA nanotech devices, the researchers used them as “nanopores” for several different molecular sensing experiments. These confirmed that it is possible, by observing changes in the electrical characteristics, to record the passage of single molecules through synthetic membrane channels made from DNA. Because this approach allows both geometric and chemical tailoring of the membrane channels, it might offer advantages over two other families of molecular sensors based on biological and solid-state nanopores. One possible application is to imitate the action of viruses or phages, breaking through the cell walls of targeted bacteria to kill them. In gene therapy, synthetic membrane channels might be used as nano-needles to inject material into cells. Such channels could also be used in basic studies of cell metabolism. Another idea is to harness ion flux — which in cell membranes moves material in and out through the channel — to drive sophisticated nanodevices inspired by other natural mechanisms. “We might be able to mimic natural ion pumps, transport proteins, and rotary motors like the enzyme responsible for synthesizing ATP,” says Dietz.